Winter is just around the corner, and just as sure as snow will fall out of the sky, your school-age kids will probably end up with at least one snow day. Snow days, well-beloved of any child are usually welcome and unexpected days off. Unfortunately, snow days can also cause a lot of grief. I mean, who really wants to spend a full day cooped up inside with nothing to do on a day when you can’t go to school? Luckily, you know that snow days are just around the corner, and if you take a few minutes to prepare some snow day activities today, your kids’ snow days at home can be fun and productive. One of the best things to have on hand for an unexpected day off from school is a well-stocked craft box. You can use any box that you have on hand, like a small or medium-sized Amazon box, or a plastic storage box. If you’re recycling an Amazon box, you can trim off or fold down the closing folds so that it can be filled with slightly larger craft items. The ultimate craft box will have a variety of drawing utensils, paper, paints, and odds and ends for your child’s artistic expression. This craft box contains a lot of fun crafting tools: feathers, construction paper, recycled cardboard sheets, scissors, a ruler, sponge brushes, acrylic pain, markers, glue and glitter glue, tape, food coloring, modeling clay, cotton balls, crafting beads, crayons, popsicle sticks, and pipe cleaners. With these tools, your child could make a whole host of diverting crafts such as paper animals, food coloring watercolor paint, drawings, paintings, and paper crafts. In addition to have the ultimate craft box, you can prepare even more by separating craft items into smaller boxes. Each craft box can feature a different craft idea or activity. 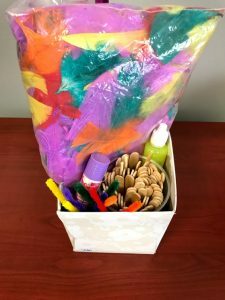 This craft box contains everything your child would need to make popsicle stick owls: popsicle sticks, blue, pipe cleaners, feathers, and markers (not pictured). Here are some extra crafts you could prepare in advance to help keep your child busy and engaged through a snow day. Watercolor and Oil Pastel Resist Painting – You’ll need oil pastels, paint brushes, watercolor paper, water, and food coloring (or liquid watercolor paints). Use the oil pastels to draw or write on the paper. Then, use the watercolor paints or water and food coloring to paint over the drawing. The paints won’t absorb where the oil pastel drawing is, so you can create fun silhouettes or creative pictures – especially with white pastels! Paper Snowflakes – You’ll need white craft paper and scissors. Take a square piece of paper, fold it in half twice (or more if you want more tiny details), and use the scissors to cut out triangles, squares, ovals, etc. Unfold it to reveal the snowflake. DIY Finger Paint – You’ll need cornstarch, water, food coloring, and recycled cardboard. Mix cornstarch with water to make a more liquid consistency (it should be more liquid than a paste), and add food coloring to make it whatever color you want. Then, finger paint on cardboard – it’s non-toxic and guaranteed fun! Keeping kids busy on a snow day isn’t just about preparing crafts in advance, it can also be as simple as using household tools to educate and engage young minds. On snow days, the most abundant resource is most likely going to be all that snow accumulating outside. Here are some activities you can prepare in advance to provide some fun and educational opportunities during an unexpected day off from school. DIY Birdfeeders – Make sure you have empty tissue or paper towel rolls, unflavored popcorn or sunflower seeds, and peanut butter or unflavored gelatin, a hole-puncher, and some yarn or twine. Make sure the cardboard rolls don’t have any leftover paper on them and use the hole-puncher to make one or two holes in it. Then, coat it in in peanut butter and press seeds or popcorn into the peanut butter. You can leave these hanging in trees near your house’s windows to feed winter birds. Kids can learn about what types of seeds winter birds prefer and what types of birds visit the birdfeeder. Balloon Marbles – You’ll just need to have water balloons, water, and food coloring. You’ll only be able to do this activity on a freezing cold day. Fill the water balloons with water, add a few drops of food coloring, and set the balloons out in the snow for at least two hours. Once they feel frozen, cut off the balloon and leave them outside as colorful lawn ornaments. Kids can learn about freezing temperatures and the conversion of water from a solid to a liquid. Borax Crystals – Your child will definitely need your help with this activity. You’ll need Borax, pipe cleaners or other object, string, water, and a heat safe jar or container. With this activity, you’ll want to bend a pipe cleaner into a small ball or other shape and then tie a string around the pipe cleaner, or other object. With a parent’s help, pour boiling water, such as what you can get from a tea kettle, into a heat safe jar, and add Borax to the water until it no longer dissolves. Hang the pipe cleaner over the jar so it is completely submerged. In a few hours, the Borax will reform into crystals on whatever object that has been suspended in the water. There are plenty of things that you can prepare in advance for a snow day, and these are just a few fun ideas to help you get started. What are your go-to crafts or activities for an unexpected day off with your kids?